Aldo's Adventure is relased somewhere around 1987. It is produced by Dave and Ben Ibach. 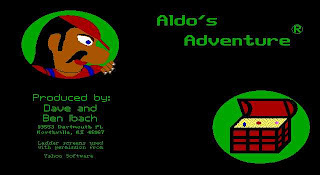 Aldo's Adventure is one of the rare game that uses high resolution 640x350 EGA graphics. 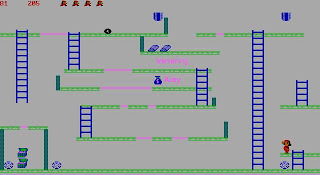 Aldo's Adventure is some sort of a Donkey Kong clone, where we need to collect the treasures by climbing ladders and avoid being hit by barrels. 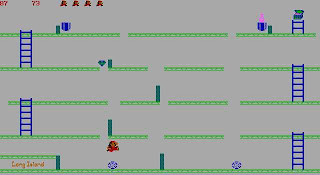 As the level advances, there will be more and more obstacles, like fire on the ground and increased number of barrels. 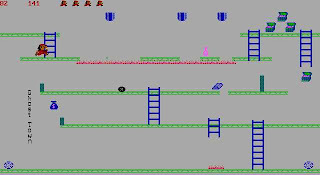 In conclusion, Aldo's Adventure is an okay platform game, and you should give it a try if you like to play Donkey Kong. You can download Aldo's Adventure here.